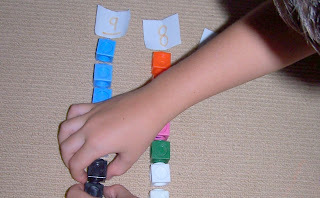 This is a simple, easy to put together game to aid in number recognition. K knows all of her numbers to 10 but sometimes she does forget here and there, I think this will really help with her recall. You need 55 items, rocks, blocks, lego, counters anything really, just so you have enough to complete the game. Place them in a basket or container of some description and pop them away from the playing area. Then on small pieces of paper write the numbers 0 -10, placing a line under 6 and 9 to show the correct way up. Fold the papers in half and place them in a small bowl or basket in front of the group. 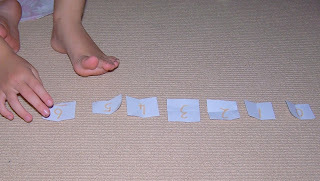 Each person takes a piece of paper, looks at their number, remembers their number, folds the paper back up and places the paper on the rug (floor) in front of them. They then need to go to the basket of treasures (blocks) and choose the correct amount of items. Come back to the group, unfold their paper, tell everyone the number they have and count their items. Keep taking turns until all of the paper slips have been used. At the end I have K take all of the slips place them in numerical order. For new excitement to the game change around the counters you use. 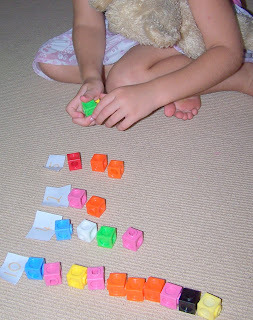 What a fun way to remember numbers and practice counting!